Perched at high altitude on a lush mountain plateau in the Alps, Crans-sur-Sierre has to be the most spectacularly scenic European Tour venue. 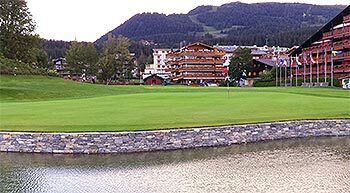 Golf was first played at Crans-Montana in the Swiss Alps way back in 1905, but at the outbreak of the First World War, the course was abandoned and it wasn’t resurrected until 1924 after the foundation of Crans-sur-Sierre Golf Club. A nine-hole course was soon laid out and then in 1928 Harry Nicholson extended the course to 18 holes. Did you know that since 1972, Crans-sur-Sierre has annually staged a European Tour event? With 40+ tournaments hosted here at Crans-Montana, that’s way more than any other course on the Tour. Slowly but surely Crans-sur-Sierre grew in popularity and in 1939, the European Masters was hosted at the club for the first time. WW2 interrupted proceedings but in 1948 the competition returned to the club and it has been held here ever since. The club enlisted Jack Nicklaus to design an additional nine-hole course on the opposite side of the road to the main 18-hole track; in 1988 the Golden Bear's Signature layout opened for play. Seve Ballesteros was drafted in to tighten up the main course in 1995 and he returned two years later to rebuild the greens after 70 years of wear and tear had taken toll. Clearly pleased with Seve’s transformation work, Crans-sur-Sierre renamed the course “Severiano Ballesteros” (it was previously known as Plan-Bramois). With its high altitude and crystal clear air, expect to be flattered. The ball travels much further up here in the Alps and you can be forgiven for thinking that you might be able to out-drive Tiger. Crans-sur-Sierre is closed and under several feet of snow for half of the year but in the summer the playing conditions are perfect. Whatever you do, make sure you bring your camera, you'll be hard pressed to find better scenery anywhere else in Europe. I’m a sucker for some nice scenery on a golf course, and this is something that Crans-sur-Sierre provides by the bucket load. Playing golf in the mountains was a treat and not something I’ve ever experienced before so my caveat here is that my joy of the course may be more influenced by this than people local to the area. On arrival, I have to be honest and say that I expected something a little grander. The clubhouse is hidden by the grandstand during the week of the Omega European Masters and it’s very unassuming. For what’s the longest running European Tour venue, I had expected something more swish. I played the course at the end of May and the greens were in horrible shape, but I had expected as much since the course had only just opened two weeks previous after a long Winter. The course itself begins with a gentle, treelined start. Barring the mountainous surroundings, nothing exceptional here for the first few holes. The 3rd is even a little funky; a par three where you need to hit an iron over a “live” road that’s protected by fencing on either side. 4 and 5 are then both enjoyable doglegs and the course noticeably starts to shift up a gear. 5 has a sharp turn right and is the first of three short par fours, between them totalling only 930 yards. The 6th looks a delight but sadly for us was out of action as they had just installed a new green and bunkers. The sand has now been shifted to the front of the green and a new wildly undulating putting surface has been constructed within the encircling woodland. The member I played with said that they upgrade one of the holes every year and the 6th is the one they’ve chosen for upgrade ahead of this year’s tournament. The 7th is then the most talked about hole on the course where you’re released from the wooded area and the scenery opens up in front of you as you approach the tee. Everything now becomes much more open from this point onward and more visually appealing, and it’s this middle stretch that is the most enjoyable part of the course. As breath-taking as the 7th is, it wasn’t actually my favourite, I’d give that accolade to the downhill par five 14th which plays towards that same wonderful mountainous backdrop and is protected by a pond that covers the right-hand half of the green. I find some courses where they’ve introduced water a little tacky, but the water is well suited at Crans-sur-Sierre. 12 and 13 both also feature large ponds and are likewise lovely holes. 12 favours someone who fades the ball as the green is angled to the right of the fairway with a large dip between the fairway and the green and the putting surface located downhill from where most tee shots will land. 13 is another famous hole, mostly for its unique in-built amphitheatre seated surround which provides that element of a tournament set-up throughout the year, without the need to erect and dismantle the stand. The closing holes continue to be pleasant but maybe not to the same standard as the middle stretch. Overall, I found the course difficult to rate. I’ve not played alpine golf before, but the scenic views were the best I’ve ever seen. I had however been told by others that the course itself was only average; whilst the course isn’t going to win any awards for golf course design, I was much more impressed with the holes than I anticipated. Finally, the course is covered in snow for around 4-5 months so if you’re going to play early in the season, expect the greens to be very patchy. It’s also well reported that the ball travels further at Crans due to the high altitude, most say that this adds approximately 10% to the ball distance but be aware that this isn’t a uniform measurement. The extra distance my short irons and wedges were airborne was more than 10% so accurate iron play is very difficult if you’re not accustomed to these conditions, so my advice is to ignore the “flyers” you’ll get into the greens and just enjoy the course and its surroundings. Wait until the greens have enjoyed the sun for a prolonged period of time, which means mid-Summer, and I’m convinced you’ll whole heartedly enjoy this excellent alpine golf experience. This course is a very pleasant walk and still quite a good test of golf. The Ballesteros course of Crans-sur-Sierre (also known as Crans-Montana) has been the locale of what is now called the Omega European Masters since the end of the Second World War (actually since 1939, but proceedings were haltered during the war). It is not a particularly long course overall, especially when one takes into account the fact that due to the altitude balls fly around ten percent farther than at sea level. Therefore, the course has undergone many redesigns and adjustments over the years to adapt to the evolution of the professional game, and to be able to attract, still today, top world players like Sergio Garcia or Adam Scott who both own apartments in town and play the course from time to time, either as part of the European Masters or when they take a recess from their respective tours. Lately, after the 18th hole was redesigned some four years ago to protect the green more prominently with water (a cascade was installed just in front of the green leading to an expanded pond left of it), the 13th par-three was totally renovated from an uphill, mostly blind tee shot to a spectacular hole with a large pond in front of a wide green surrounded on three sides by a grass amphitheater where 3,000 people can admire the pros’ precision shot making. Last year saw an upgrade of the fairways of the incoming nine, and the greens’ maintenance system. Next year a new irrigation system will be put in place, and at the end of season 2019 the nine fairways going out will also be upgraded. All of this is aiming of course at retaining the interest of the pro players in the European Masters, the success of which in turns determines in good part the welfare of the club through the thousands of visitors who book tee times during the short playing season. Located at 1400 meters above sea levels, the golf club does not open before May in general, and closed in October. As a result of the above, the course is very pleasant to play. It is renowned for the view of the Alps from the green of the 7th, a spectacular par-four which a number of European Masters competitors try and drive from the tee to set themselves up for an eagle, despite the big bunker in front of the green and the complicated slopes of the putting surface. On a clear day, the view of both the Mont-Blanc (some 60 kms away southwest down the Rhone valley and the Matterhorn (40kms south southeast) is indeed special. The players enjoy a few other nice viewpoints on the mountains, but mostly the course is a parkland course with rows of trees between the holes so their attention is not distracted too often. From mid-June and until September when the big tournament is usually scheduled nowadays, the condition of the course can be relied upon to be between good and perfect. The greens are prepared specifically for the first weekend of September, but through the rest of the season they still offer very good playability and speed. Apart from the 7th hole and its view, the first half of the course offers a good rhythm, with the first real tough hole being the 4th, a long, downhill par-four measuring 460 meters from the tips, and finishing with the hardest hole on the course, the long 9th with 545 meters from the back tees to reach the green. Interestingly, the two par-fives are at either end of the half, while in the second half of the course they are one after the other and in the middle of the run (14th and 15th). Before you get to them, you have to negotiate the 12th though, where your drive should reach the top of the small hill in front of you but not further if you want to have a good view of the green down on the other side while avoiding an awkward, downhill lie for your approach shot. The par-three 13th is also fun to play with its amphitheater behind the green. The downhill 14th is a challenge in disguise: a very good drive might give you the impression you could reach the green in two, but beware the lake front and right, the trees very close to the green on the left and the out-of-bounds behind! Still, if you lay up, your lie will be downhill, making the approach shot just this much more complicated. And then the parallel, but uphill 15th is definitely a long haul to the green where the pin can be hidden from sight unless you are less than 135 meters from the green if it is located at the top of the putting surface. The finishing holes are not as easy as they look. The 16th (a long par-three for the pros, a short par-four the rest of the year) is on the narrow side, with a couple of firs guarding the green against low or off line approach shots. The green of the 17th is quite slanted, so the approach shot must be precise for a real chance at birdie. The 18th is a little easier today than in the past, and is designed to provide an entertaining finish for the tournament as a birdie hole. Crans-sur-Sierre and specifically the 18 hole Ballesteros course (not the 9 hole Nicklaus course) is located at 1500 m above sea level. The locals told me they measured a 10% increase in ball flight distance, which makes it flattering to play as you hit the ball further. The scenery is great with Valais valley views, particularly looking south west towards Sion (e.g. 7th hole) and some great view to nearby mountain peaks. The course itself is more or less a parkland style course but more hilly. Some of my favourite holes are 7 (par 4), 12 (par 4), 13 (par 3) with a hillside amphitheatre, and 18. Some of the holes are a little bit narrow, but none are really narrow. The best time to play is usually mid summer, but it really depends on when the snow melts away and the course has substantially dried out. Green fees are typical Swiss - not cheap but not as expensive as some. And I find Valais golfers are pretty friendly. Crans-sur-Sierre in the Swiss Alps is without doubt one of most stunning locations in world golf. As the course is perched high upon a 1500 metre plateau, it can be very difficult to tear your eyes away from the incredible surrounding landscape. The course has undergone several redesigns, including changes made by Seve Ballesteros in 1997. More recent modifications have created several lakes, rivers and tees which has created a more exciting layout. The round opens up with a handful of fairly straightforward tree lined holes, the 3rd being an attractive par 3 with a tricky sloping green. After a couple of interesting short par 4’s nothing can prepare you for the jaw dropping panorama which awaits you on the 7th tee. The views of the snow capped peaks and the Rhone valley below are simply breathtaking. The back 9 is the better of the two halves for me with a number of memorable holes. The 12th is an excellent par 4 which requires a good drive to provide a clear view of the sunken green which is well defended by a lake. The 13th is the standout par-3, the green sitting within its own attractive amphitheatre of 3,000 seats. With water short and left, a shot of 180 metres is required to reach the middle of the green. Water must also be avoided on the approach to the excellent downhill 14th. This is my favourite par-5 as it offers the option to go for the green in two if you get a good drive away. However with water short, trees left and anything over the green out of bounds, it takes nerves of steel and real precision to create an eagle opportunity. Played here in the Credit Suisse Gold Pro-Am just ahead or the Omega tournament and was really impressed. It's not the most strategically challenging course, but it's wonderful fun in the thin Alpine air and yes, the ball does seem to travel further, but in my case not quite as far as the Pro I was playing with! I really recommend Crans as a playable holiday track for the handicap golfer and the views are stunning.